Seu pai SOULA JULE STAR: Por Grays Starlight. Ganhador de U$129.222,00 em Apartação. Campeão do Abilene Spectacular Non-Pro Derby, Campeão do Sun Coast Non-Pro Derby, Campeão do Sun Coast Winter Round Up Non-Pro Derby, Campeão do Tejon Ranch Non-Pro Derby, Res.Campeão do NCHA Non-Pro Derby, Res.Campeão do PCCHA Non-Pro Futurity, Res.Campeão do PCCHA Non-Pro Stakes, 3º no NCHA Non-Pr Super Stakes, etc. Produtor de +U$1.613.718,00 em Apartação, Rédeas, Working Cow Horse. Entre os 25 Melhores Reprodutores de todos os tempos em WCH pela NRCHA. Pai de destaques como: GUARANTEEYA JULESTAR, U$160.668,00 em Apartação, Campeã Mundial NCHA $5K Novice Non-Pro, Res.Campeã Mundial NCHA $3K Novice, etc. ; DOCS SOULA, U$144.314,00 em WCH, Campeão do NRCHA Open Derby, Res.Campeão do NRCHA Open Stakes, Res.Campeão Mundial AQHA em WCH, etc. ; I BEN THINKING, U$121.161,30 em Apartação, finalista do NCHA Non-Pro Futurity, etc. 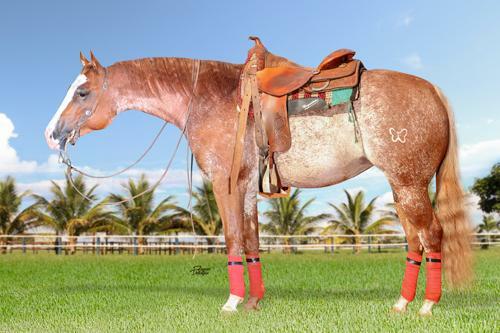 Avô materno de matrizes que produziram +U$300.000,00, com destaque para seu neto BET HES BLACK, U$115.361,00 em Working Cow Horse, Res.Campeão do NRCHA Snaffle Bit Open Futurity/17, etc. LIL ITTY BITTY KITTY (por High Brow Cat). $50,766: finalist in the NCHA Open Futurity. E filha de HIGH BROW CAT, U$ 126.252,00, Campeão Augusta Classic Open e Chisholm Trail Classic Open. Reprodutor no. 1 das estatisticas de Apartação de todos os tempos, tendo seus filhos ganhos de mais de U$ 73,2 milhoes, entre eles: DONT LOOK TWICE, U$ 843.096,00 NCHA Horse of The Year; METALLIC CAT, U$ 637 mil; BOON SAN KITTY, U$ 565 mil, NCHA Horse of the Year; 2x Campeã NCHA Derby, Campeã PCCHA Futurit; Líder das estatisticas como avô materno (Equi-Stat), tendo suas filhas produzido ganhadores de mais de U$ 21,1 milhões. Ganhador de U$129.222,00 em Apartação. Campeão do Abilene Spectacular Non-Pro Derby, Campeão do Sun Coast Non-Pro Derby, Campeão do Sun Coast Winter Round Up Non-Pro Derby, Campeão do Tejon Ranch Non-Pro Derby, Res.Campeão do NCHA Non-Pro Derby, Res.Campeão do PCCHA Non-Pro Futurity, Res. Campeão do PCCHA Non-Pro Stakes, 3º no NCHA Non-Pr Super Stakes, etc. Produtor de +U$1.613.718,00 em Apartação, Rédeas, Working Cow Horse. Entre os 25 Melhores Reprodutores de todos os tempos em WCH pela NRCHA. Pai de destaques como: GUARANTEEYA JULESTAR, U$160.668,00 em Apartação, Campeã Mundial NCHA $5K Novice Non-Pro, Res. Campeã Mundial NCHA $3K Novice, etc. ; DOCS SOULA, U$144.314,00 em WCH, Campeão do NRCHA Open Derby, Res.Campeão do NRCHA Open Stakes, Res.Campeão Mundial AQHA em WCH, etc. ; I BEN THINKING, U$121.161,30 em Apartação, finalista do NCHA Non-Pro Futurity, etc. Avô materno de matrizes que produziram +U$300.000,00, com destaque para seu neto BET HES BLACK, U$115.361,00 em Working Cow Horse, Res.Campeão do NRCHA Snaffle Bit Open Futurity/17, etc. Ganhadora de mais de U$ 138 mil pela NCHA. - HIGH BROW CAT (High Brow Hickory) U$ 126,252,00: Campeão Augusta Open Classic; finalista NCHA Open Super Stakes, NCHA Open Classic, NCHA Super Stakes Open Classic; Chisholm Trail Classic Champion. Reprodutor no. de Apartação. - SMART LIL HIGHBROW (High Brow Hickory). U$ 99,099: 4o.L NCHA Open Super Stakes; 3o.L NCHA Open Classic; 5o.L NCHA Super Stakes Open Classic; 7o.L NCHA Open Derby; Res Campeão Chisholm Trail Open Classic; 3o.L Abilene Spectacular Classic/Challenge. - SMART BRONZE (Smart Little Lena) U$ 72,347: 3o.L NCHA Open Derby & Open Classic; Campeão Texas Gold Open Derby; Res Campeão Southern Open Derby; finalista NCHA Open Challenge. - HIGH CLASS KITTY (High Brow Hickory). U$29,133: 7o.L NCHA Open Super Stakes; 8o.L NCHA Open Derby; finalista NCHA Super Stakes Open Classic e Memphis Open Classic. -- RISTOL NORTH, U$33,377: finalista Brazos Bash Open Derby; Res Campeão Louisiana Kajun Open Classic; finalista Augusta All-Age $50,000 Amateur finalist; AQHA ROM. -- VARIEGATED WEED (AQHA/APHA) U$14,704: finalista in the NCHA Limited Non Pro Super Stakes; 3o.L Congress Non Pro Futurity. --TUMBLEWEED SMITTY, U$ 12,772: finalista NCHA Amateur Derby e The Non Pro 5/6 Anos Non Pro. Classic/Challenge and NCHA Super Stakes Open Classic. Dam of 10 foals of performance age (two 3-year-olds of 2009), 5 money-earners, $310,018, including? LIL LENA LONG LEGS (f. by Smart Little Lena). Above. LIL ITTY BITTY KITTY (f. by High Brow Cat). $50,766: finalist in the NCHA Open Futurity. Derby and CHA Nebraska Open Derby. $100,000 Limited Open Derby Champion; 3rd, Texas Cutting Open Futurity; finalist Brazos Bash Open Futurity. Lucys Lil Starlight (Grays Starlight). $3,707: Wyoming Futurity finalist. Dam of? Champion; finalist NCHA Open Classic. Dam of 13 money-earners, $742,017, incl.? Invitational Open Derby and Memphis 4-Year-Old Non-Pro Futurity, etc. 4th, NCHA Super Stakes Non-Pro Classic; NCHA Youth & Non-Pro Top Ten. LIL LUCY LONG LEGS (f. by Dual Pep). Above. Reserve Champion; 4th, Memphis 4-Year-Old Non-Pro Futurity. MY CDS JUMPING (g. by CD Olena). $24,812: top 10, PCCHA Open Futurity. Open Classic Champion. Dam of Duallys Lil Scoot ($7,036 to 4, 2009). Classic; 3rd, West Texas Open Derby; 5th, Ike Hamilton Open Derby. EXPLICIT LYRICS (f. by CD Olena). $16,903: 5th, Tunica 4-Year-Old Limited Open Fut. Dual Matrix (f. by Dual Pep). $6,540: Oklahoma Early Bird Non-Pro Derby Champion. Lucys Lil Sister (f. by Dual Pep). 2008 Breeders Inv. $10,000 Limited Open Derby finalist. Senorita Dually (Dual Pep). $3,391: NRCHA National Limited Open Hackamore Leader. Dual Suspension (g. by Dual Pep). NCHA Certificate of Ability. Breeders 4-Year-Old Non-Pro Futurity Reserve Champion).